This walk: 2010-10-20. 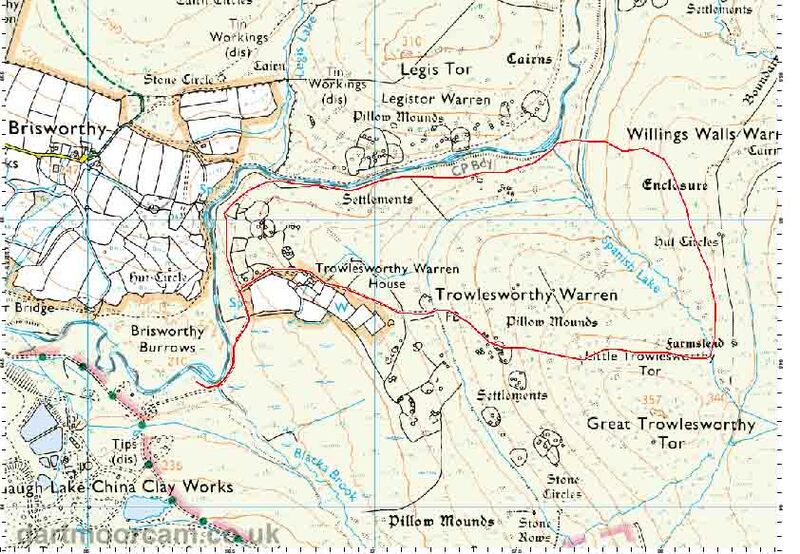 River Plym, Spanish Lake, Trowlseworthy Tors (saddle between), “The Drum”, settlements, Trowlseworthy Warren farm. General view of the River Plym. General view by the River Plym. Well built walls forming an enclosure, probably rabbit proof. Hugh summits Shadyback Tor (in the shade!). Looking north west to Legis Tor, elevation 340 m (1115 feet). Looking almost due north to Gutter Tor, elevation 350 m (1148 feet). Sphagnum moss, grass and grazed soft rush. Looking south west to the Trowlesworthy Tors, elevation 357 m (1171 feet). View north east: Gutter Tor, North Hessary Tor, Down Tor, trees at the Scout Hut and sun shining on the very top of Coombestone Tor. Spanish Lake - so named because on learning about the approaching Spanish Armada, the inhabitants of Trowlesworthy dashed up to the head of this little stream and buried all their wealth – apparently. Hugh at the summit of Greater Trowlesworthy Tor. Smug - it was b difficult getting up there! Blah blah blah on and on and on. Everyone else has gone …..
Our leader extolling something into the wind ..... it must be a Dartmoor tale! Hugh atop Little Trowlesworthy Tor. There’s that funny little creature again, any ideas? The usual caption: Fox Moth caterpillar (July-October), about 8 cm / 3 inches in length. Heather, bramble, and bilberry are among its foodplants. It will be fully grown by the autumn. It will then hibernate, to emerge next spring without feeding, pupate in March/April and be on the wing in May. Click here for: a photo of an adult. The clay works leat again. Highland cow, not at all perturbed by us strolling by - if I was built like this, I wouldn't be that bothered, either! Rabbit bury or “pillow mound” as OS prefer to call them. ..... again, doing its Road Runner impersonation before disappearing into one of the rabbithen burrows. This area is National Trust-owned. This walk was accessed by driving to Cadover bridge (north of Plympton, south of Dousland and Burrator reservoir) and driving along the road right beside Cadover Bridge, up-river, (easterly) for about 800 meters (0.5 mile) to the parking area to the left.